Floor to ceiling windows bring the mountain views and the entire town of Breckenridge into this recently-built home. Located on a quiet street off Baldy Road, you'll be mesmerized by the expansive views without even getting off the couch. At this home on the hill, you'll find no reason to leave the comfort of this breathtaking location. This pristine never-before-rented 4 bedroom, 3.5 bathroom home is everything a mountain home should feel like. It features heated floors, plush new carpeting, and new furnishings throughout. The home is dispersed between 3 floors. Enter the home through the heated 2 car garage on the lower level. Up a flight of stairs is the main living level with 18 foot ceilings, large windows, and an open kitchen and living room floor plan. The kitchen is fully equipped with everything you need for a home-cooked meal, and there's plenty of seating for everyone. Just off the dinning area there's a private balcony with grill. The upper, 3rd floor level is a private haven for cozy and quiet relaxing. The master bedroom features high ceilings, window treatments, and a large en suite bathroom with separate shower and soaking tub. This house is not short on space! 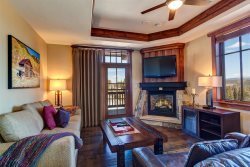 The home sits 4 miles from downtown Breckenridge and the Breckenridge ski resort high atop the western facing slope of Bald Mountain. No car? No problem. There's a stop on the Summit Stage bus at the corner of North Fuller Placer and Baldy Road providing direct access to all that Breck has to offer. Stay Summit was absolutely wonderful to us. They accommodated our every need and went above and beyond to make sure we were taken care of! What an amazing place! The views from the living room and kitchen are absolutely phenomenal. Our expectations were met and exceeded by both the place and Stay Summit. We had a party of 6 adults and had plenty of space for each of us. If you're looking to do activities on Main Street, it is only a short drive there.